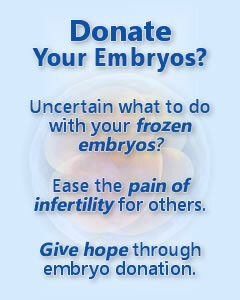 Welcome to Embryo Donation International! Thank you for visiting Embryo Donation International (EDI). To increase the number of cryopreserved embryos donated while reducing the number of frozen embryos discarded or abandoned. To assist in matching donated embryos to patients in need in an ethical, fair and nondiscriminatory fashion. 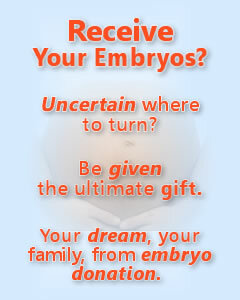 To provide the largest selection of donated embryos we can so embryo recipients can have the best choice possible. As a subdivision of Specialists In Reproductive Medicine & Surgery, P. A., we have been performing embryo donation since 2001 making us one of the most experienced embryo donation facilities in the U.S.A. We welcome you to EDI & wish you success in all that you do. This versatile program, the first for the U.S., will allow embryo donors the choice, with their permission, to eventually be contacted by the donor-conceived offspring! To learn more about this amazing program, click here.